After a day of missing avatars, lost Tweets, and vanishing DMs, Twitter is down for the count (at least for the next 30 minutes or so). 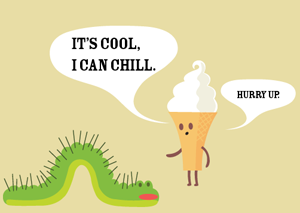 The site has posted its ‘unscheduled maintenance’ image, featuring some frozen yogurt and a caterpillar in lieu of the infamous Fail Whale (which now seems to be reserved for temporary glitches). And the status blog now says that the site will be down for an hour or so (which began at 5:45 PM PST). Twitter was notorious early last year for its rare bouts of uptime, though the service has performed admirably since last summer despite incredible growth. Now that the service is down this evening, it gives users the perfect opportunity to try out the new FriendFeed beta. Update 6:28 PM PST: And they’re back after less than 45 minutes of downtime. Not too shabby.